The Wonkidos Animated Social Skills are fun, award winning, silly cartoons that teach children important lessons in a fun animated way! Each Wonkidos episode is a short animation modeling correct behaviors that is fun and interactive for all young children. Let the Wonkidos help your child learn important social and life skills for positive social interactions. Kids learn best when engaged and having fun. Video modeling helps teach your child the correct behaviors of what to do in the correct situation. 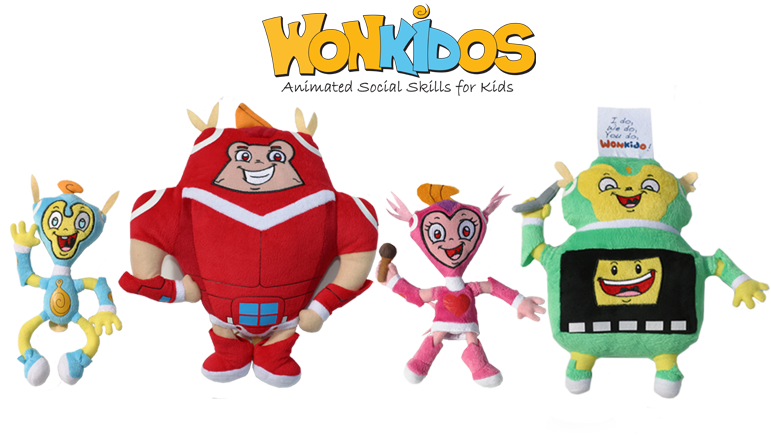 The Wonkidos also have plush toys available to help encourage children to engage in pretend play and imagination. approaches to teach children everyday skills regardless of age or developmental level. each video. Making them the most effective and successful for children.